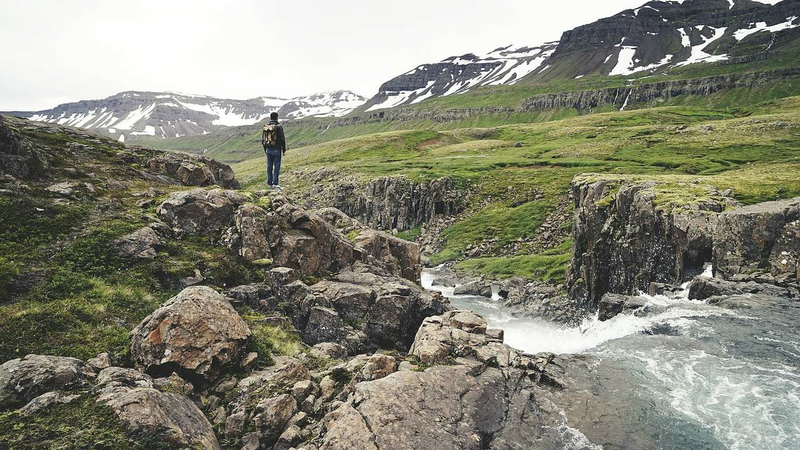 When it comes to Iceland it is not easy to choose where to go hiking, there are many beautiful places in the country that would be ideal for both short and long hiking routes. You should bear in mind many factors when you choose where to go: weather condition, level of difficulty, the amount of time you have, how convenient it is to get there, of course stunning landscapes play crucial role in decision making process. So what are the best spots for hiking? It might be not the most fascinating hiking experience, but the location of Esja does make it one of the most popular hiking places in Iceland. Located just outside Reykjavik, it would be ideal route for those, who don't have much time and can't travel far away from the capital. The bus from city centre will take you directly to the trailhead, it is suitable for inexperienced hikers, as the 7 km trail is relatively easy, there is an opportunity to walk longer, but it might require some skills and experience. It is probably the most popular multi-day hiking destination in Iceland. It starts in the picturesque area of Landmannalaugar and ends in fascinating Thórsmörk. Bear in mind that due to weather conditions trails are not always opened. Most likely you will have a chance to hike in Laugavegaur between late June and September. For that reason sometimes there are a lot of tourists, so you won't be able to feel alone with nature. On the way there, you would find plenty of options for putting a tent, but be aware that the weather almost certainly will be a mixture of rain, snow and fog. To be able to visit Gylmur waterfall, the second biggest waterfall in Iceland, you have to reach it by foot. The trail starts near Hvalfjörður, approximately an hour from the capital, and goes through stunning green canyons, ancient caves and wildflowers. It is rather difficult route, however it is definitely worth it, the area is so stunning, that you will forget about all problems and worries that you had before!